Are Rustic Barn Weddings on a Downward Trend? I’m not much of a trendy person. “Trend” is now, but now is so short. Instead of fads, I believe in timelessness and originality. On the flip side, my wife, Annie, can be quite trendy. There’s nothing wrong with knowing and applying the latest fashion, knowledge, and know-how. Except when it comes to your wedding. There’s nothing wrong with keeping up with the latest clothing fashion, knowing that you’ll be sending a few boxes to Goodwill in the next couple years. Nothing wrong with furnishing your kitchen with stainless steel appliances, even if they’ll be out of vogue in 5 or 10 years. But when it comes to your wedding, all you’ll have are your pictures. Do you really want to look at them in 20 years – or even 5 years – and cringe at how horribly out of date they are? According to some recent sources, rustic barn weddings, such as barn wedding venues in Maine, may be on a downward trend. In December, Vogue Magazine’s 14 Wedding Trends to Avoid in 2017 said this: “Rustic has become an almost taboo word.” Instead, “timeless” was its lovely antithesis. 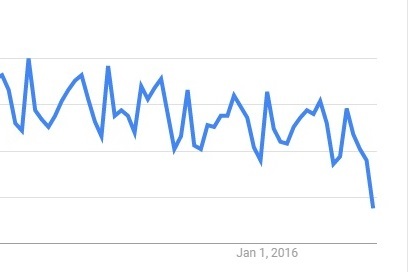 Setting aside the subjective views of wedding experts, we can look at objective data on the search trending of “barn weddings,” thanks to Google Trends, shown below. 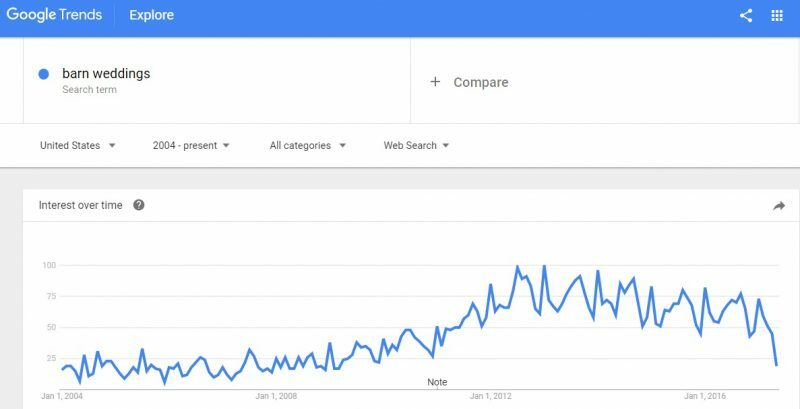 Searches have stopped increasing and have been dropping over the past couple years. To use the mathematical term, the search volume is “concave down,” which is another way of saying that search volume is not just decreasing, it is decreasing at a progressively faster rate. In other words, according to this chart, the barn wedding fad may be on a downward trend. However, to be fair, we should also look at trends of competing wedding concepts, including beach weddings, hotel weddings, church weddings, and destination weddings. What we see from this is that searches for all of these popular concepts have been decreasing. In fact, “barn weddings” is the only search whose volume has increased since 2008, although it is has been dropping since around 2013. We might have chalked up the decrease in search volume, starting around 2008, to the housing bust and recession, but it has continued to fall long after that. 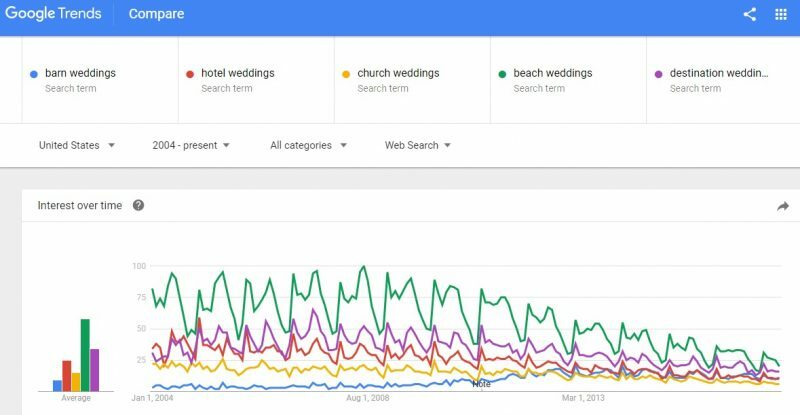 Also, more importantly, the number of weddings per year has not been decreasing — so why has the search volume systematically dropped across all major search terms? I don’t know! Perhaps brides are relying more on word of mouth, magazine descriptions, blogs, and reviews on such websites as TheKnot.com. Perhaps brides are just better informed now and are less trusting of whatever search results pop up in Google. The question posed by this blog post was: Are Rustic Barn Weddings on a Downward Trend? The answer? It doesn’t matter! A rustic Maine barn wedding venue might fit you and your partner like a glove. By all means, if you’re looking for great country wedding ideas, Maine (and New England in general) are the ideal places for barn weddings. In fact, several barn venues are listed in our post on the Best Wedding Venues in Maine. Or maybe you’ve always dreamed of being a princess in a castle-inspired wedding venue. Again, New England is full of regal, classic wedding venues. Or maybe all you’ve ever wanted was a cozy backyard wedding like in Father of the Bride. So instead of considering what’s popular, I’d encourage you to follow your heart, forget the trends, and pursue the wedding of your dreams. This is your special day; all that matters is how you feel when you’re surrounded by family and friends as you commit your love and life to your partner. Still, if you happen to be searching for a classic and luxurious wedding venue, here is a photo of a Maine landmark that I hold in high regard, the Agora Grand Event Center. What Are Luxury Wedding Venues?